The UK's biggest Easter Electronic Music Event! 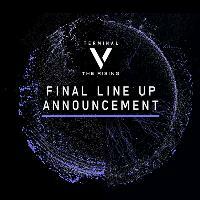 Terminal V returns in 2019 for the biggest event to date when over 13000 people will descend upon the vast warehouse complex of The Royal Highland Centre for an 11-hour electronic music extravaganza, featuring a carefully curated lineup of legends and emerging international acts over multiple indoor + marquee stages and Audio/Visual installations to blow your mind. Halloween 2018 sold out in advance, we expect the same again. BEWARE OF FAKE TICKETS AND SCAMMERS – ONLY BUY FROM AUTHORISED OUTLETS. DO NOT BUY OFF SOCIAL MEDIA SELLERS, AS THIS USUALLY LEADS TO REFUSAL OF ENTRY. Shuttle buses shall be running all day and night to and from the city centre/venue. Details to be released soon.